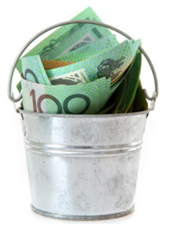 In regards to the following popular grant programs our Client feedback continually indicates that we are the lowest fixed fee service provider nationally with our fees being based on time and effort, not large unnecessary ‘commissions’. Further, we often work with Clients who may have already done some work in preparation for their grant applications, which further reduces our efforts and costs. Why not join our army of Clients who have successfully received grant funds from the EMDG over many years ! The EMDG is one of those non-competitive grants that you wish you knew about years ago when you started to try and export, where you basically get the grant as long as you spend the minimum of $15,000 on eligible marketing costs, which can be spread over two consecutive financial years for first time applicants. This grant reimburses up to 50% of eligible export promotion expenses and provides up to seven grants to each eligible applicant. Applications for each year can be submitted from July up to the end of November, so get in early to get your funds back asap ! Why not join our many Clients who have successfully received grant funds and other assistance from this popular Accelerating Commercialisation program ! Provide participants a dedicated Case Managers and benefit from our Expert Network. We can assist you to apply for Accelerating Commercialisation support at any time of the year. Why not join our many Clients who have successfully received grant funds from this popular program over many years ! The R&D Tax Incentive is a generous and easy to access entitlement program that helps businesses offset some of the costs of doing R&D. The Program aims to help more businesses do R&D and innovate. It is a broad-based entitlement program. This means that it is open to firms of all sizes in all sectors who are conducting eligible R&D. Non-refundable 40 per cent tax offset (equivalent to 133 per cent deduction) to all other eligible entities. 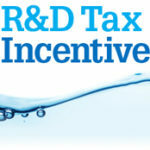 AusIndustry and the Australian Taxation Office are responsible for delivering the R&D Tax Incentive. Why not join our many Clients who have successfully received grant funds from the Textile, Clothing and Footwear (TCF) Small Business Program. This provides grants of up to $50,000 for projects to improve the business enterprise culture of established TCF small businesses that have not received grants or qualify for assistance from other TCF programs. TCF small businesses must manufacture an eligible TCF product in Australia, or design an eligible TCF product for manufacture in Australia. They must have fewer than 20 employees; have a minimum turnover of $100,000; and provide a minimum cash contribution to the project of 25% of eligible expenditure. 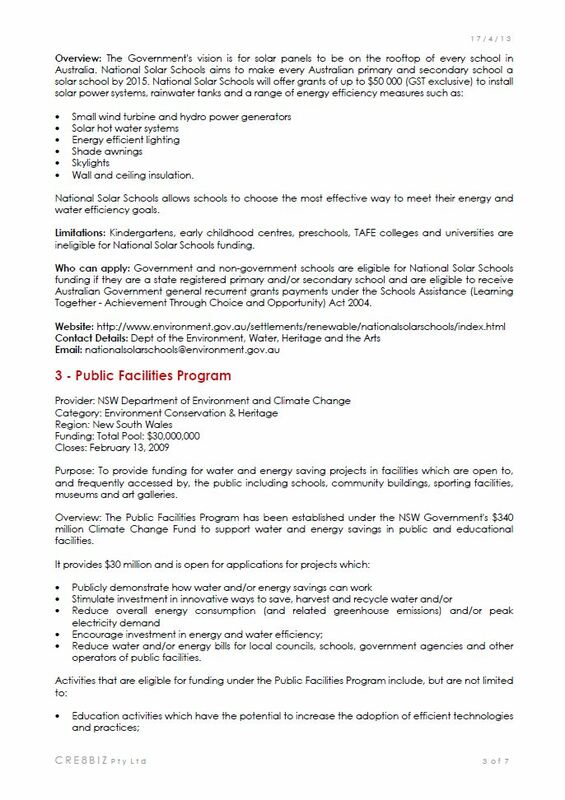 The program is competitive and applications are assessed on merit, so contact us quickly so we can get your application across the line pronto ! Tailored Grant Research Report that is a compilation of thoroughly researched and available grant programs from our national data base of Federal Government, State Government and Philanthropic grants. 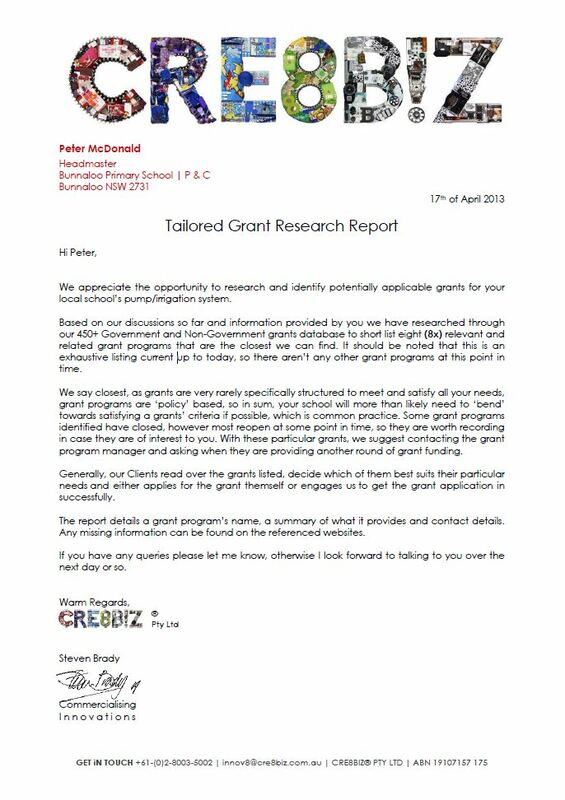 If you are unsure of which grants are applicable to you, we can pull together a comprehensive Tailored Grant Research Report of ALL grants currently available to you from our database, which would take you weeks to months to compile. Given all the grant programs can change at any moment, this report is invaluable in that it provides a current snap shot of what grants may have expired recently, are currently still available, what are coming up soon or come around again in the future. Typically we identify 6 to 20 grants of varying funding amounts, generally in the tens of thousands of dollars each!Why wait, you could be able to access thousands of dollars, so call or email us below now to get your Tailored Grant Research Report within 5 business days for $450 $363. Liaising service on behalf of you with grant providers to independently and professionally ascertain their level of interest with your particular unique story and what their current ‘internal’ mandates are, which is often different to what they promote. 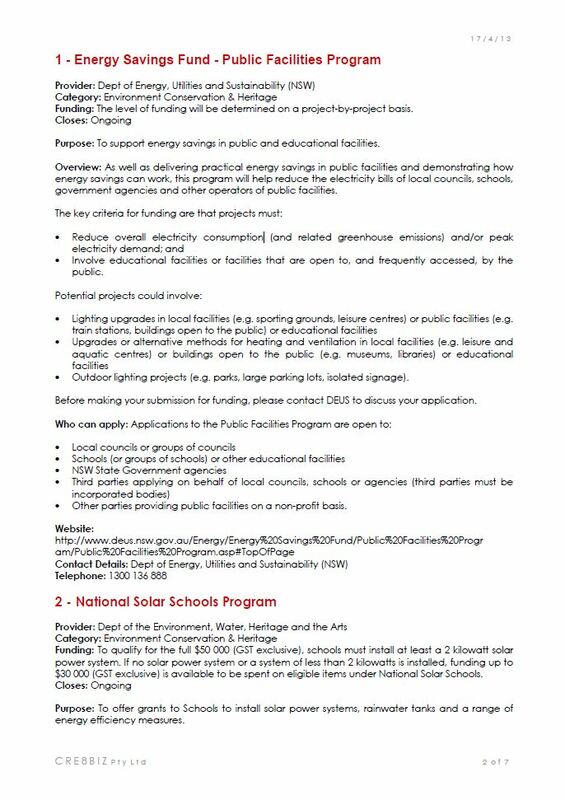 Why spend enormous amounts of energy in applying for a grant program if the grant provider isn’t interested ? Make sure first !We have found over the many years of dealing with grant providers that they often have marketing material that can communicate uncertainty with possible grant applicants. This miscommunication often renders a well intended grant application to the bin, in fact that’s where most go. To avoid what is typically a huge effort by grant applicants in writing and obtaining supporting documents going to the bin, we provide a smart upfront service where we contact the grant program manager and discuss the merits of what you want to apply for to seek their thoughts and guidance knowing that the grant provider often changes their internal approval process and mandate. This process gleans direction and often confirmation that a potential grant application is or isn’t on the right track before many man days having been exhausted.If you are unsure and would like some assistance talking to the grant provider, then why wait, you could be able to access thousands of dollars, so call or email us below now to get us to represent your story, we can normally do this within 3 business days for $450 $299. 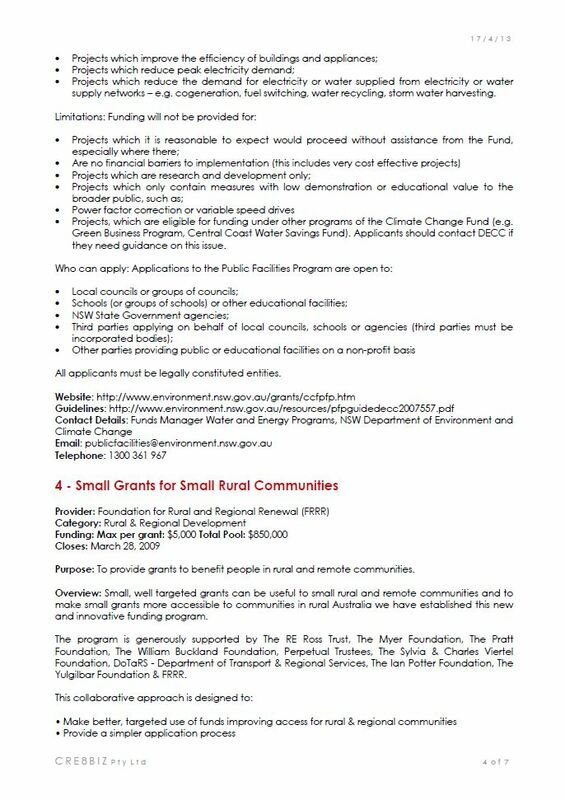 Assistance in implementing and managing grant funds for dedicated projects. We don’t disguise our fees into a grant’s scope of works budget, like many commission based grant writers do to cover their large fee, particularly as grant programs don’t cover writer’s fees ! We are also trained by all the larger grant providers as specialist grant writers, so we know what grant programs want in their application and we are also acutely aware of how they operate internally once they receive a grant application, that is, how they process their Formalities Check and how their Review Committee operates. Our Client feedback indicates that we are the lowest fixed fee service provider nationally with our fees being based on time and effort, not large unnecessary ‘commissions’. Further, we often work with Clients who may have already done some work in preparation for their grant applications, which further reduces our efforts and costs. In light of the above, please let me know if you have any queries or require any further information, otherwise why not get your fare share of the grants funds out there that you can tap into ! Why not ! They are out there in abundance, so why not lets us assist you to spin your story and see how far you go. We assist Clients to find and submit their Award application to earn the prize, kudos and exposure that come with such. Most Awards are highly competitive, so you may need a hand. To be honest, from assisting hundred of Clients over the years in the Tendering process, we can say that there are similarities between applying for a Tender and a grant and an Award, its complicated, complex, volumous, like a process in book writing and competitive, so you will need a hand, so give us a call.